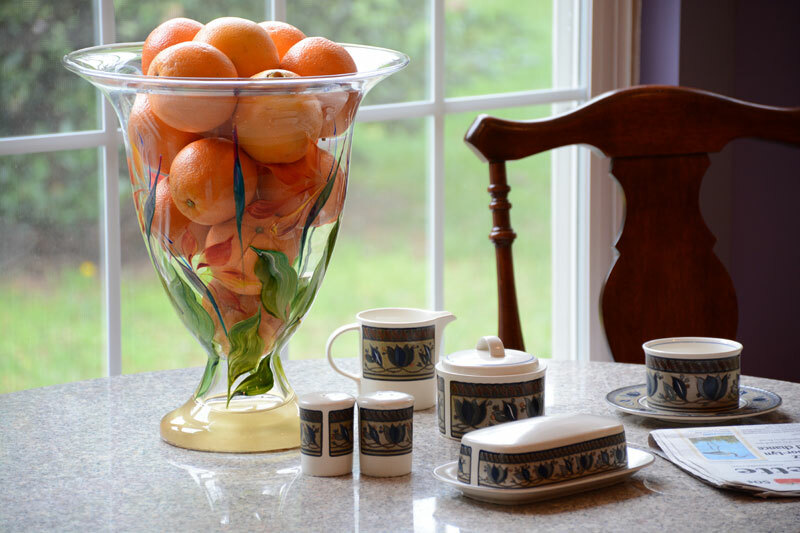 MONI’S RETREAT – Dining Room | Rehoboth Beach, DEWe believe in simplicity in design. This includes even our accessories. 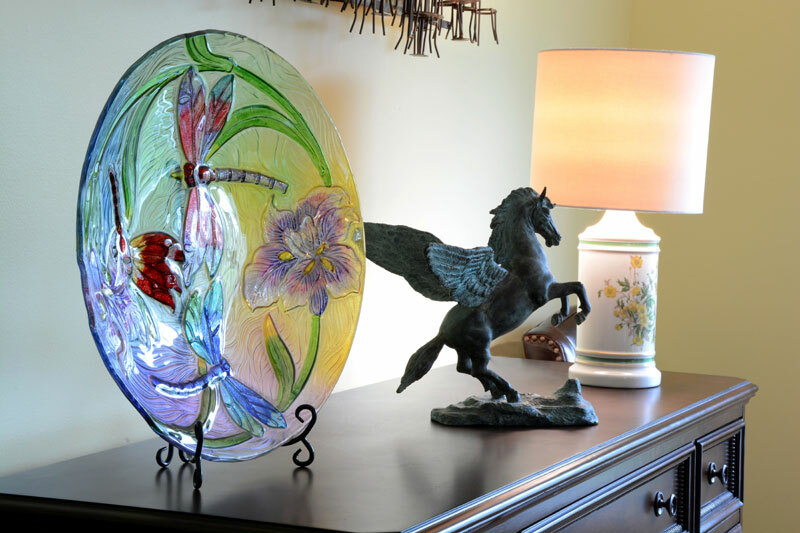 Here we refurbished Moni’s hand painted china lamp, and augmented it with a brass pegasus and dragonfly plate. MONI’S RETREAT – Dining Room | Rehoboth Beach, DEThis dining room was designed for small intimate dinners with friends, as well as to facility meetings of Moni’s charity and community groups. The table seats six to eight. An extension leaf is stored in the hutch. The leather chairs are brought to the table for more formal occasions. 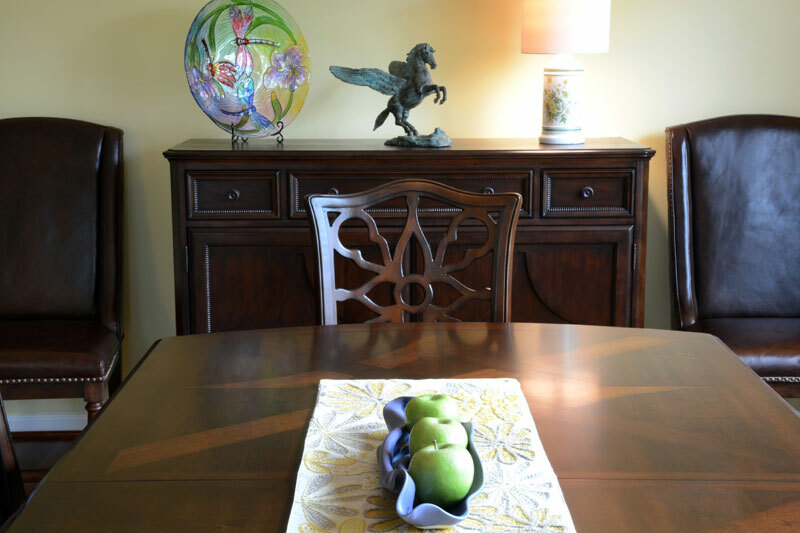 MONI’S RETREAT – Dining Room | Rehoboth Beach, DEThe richness of textures in the room is nicely captured in this shot. The artisan handmade porcelain bowl pulls the purple accents from the kitchen and breakfast nook. 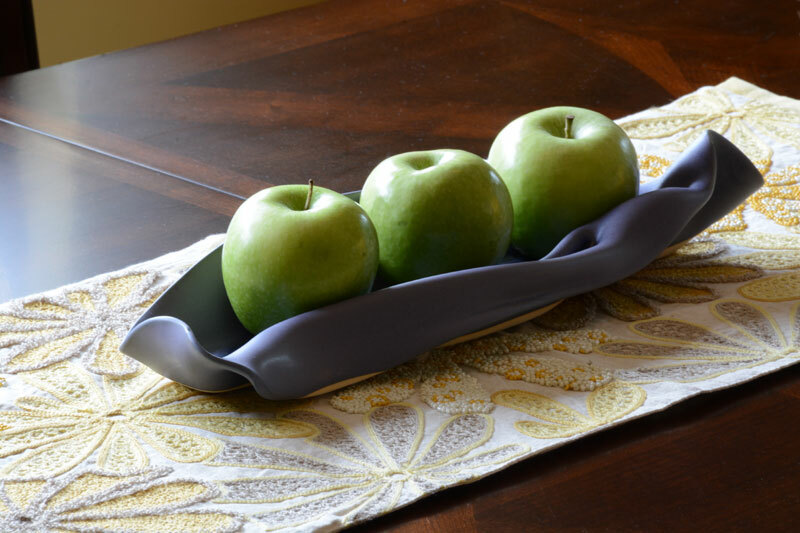 The beaded runner highlights the bowl and apples and make them standout against the inlaid wooden table. 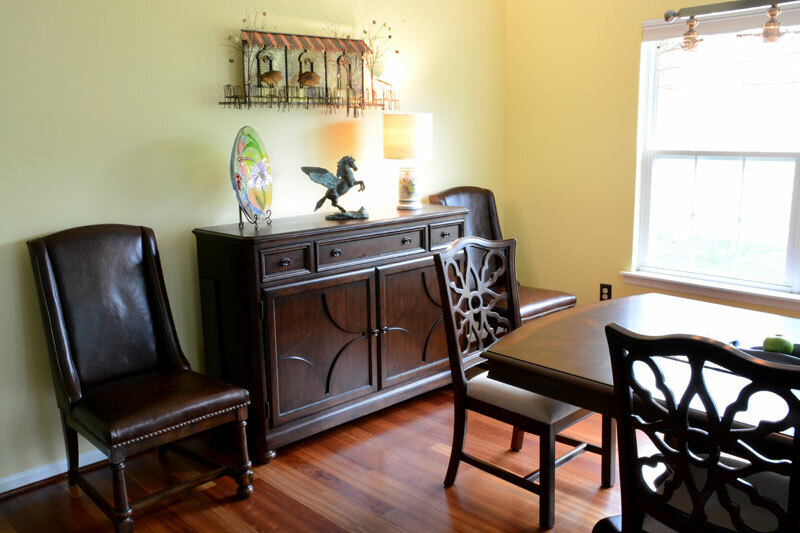 MONI’S RETREAT – Dining Room | Rehoboth Beach, DEDue to Moni’s allergies, we invested in a superior HVAC system that monitors air quality and maintains a constant humidity level. Additionally, care was giving to using natural materials and textiles. We also minimized our use of fabrics in our choice of furnishings and window treatments, to provide easy to clean surfaces. 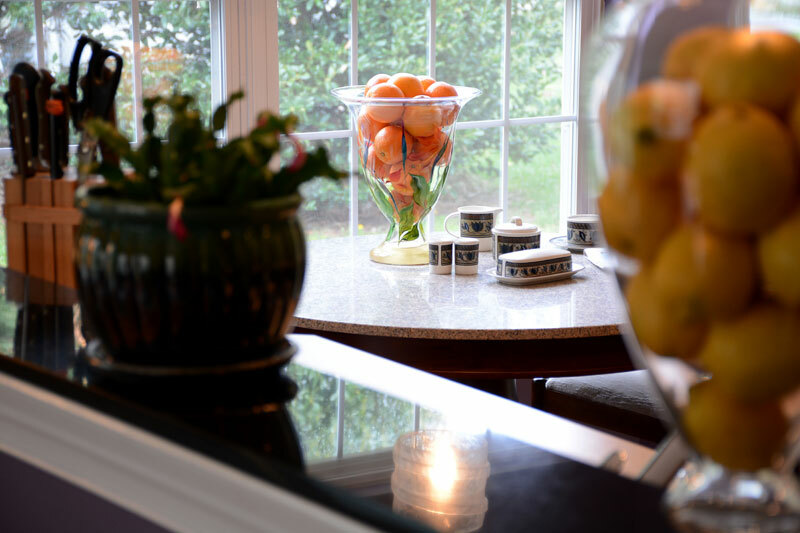 MONI’S RETREAT – Breakfast Nook | Rehoboth Beach, DENestled in a bay, is the breakfast area. A marble top table situated below our carefully selected hand blown glass pendant akin to dining room chandelier, sets the tone. With a commanding view of the gardens, it lends itself to bird watching. MONI’S RETREAT – Dining Room | Rehoboth Beach, DEThe hand blown glass chandelier is a great accent to this space. 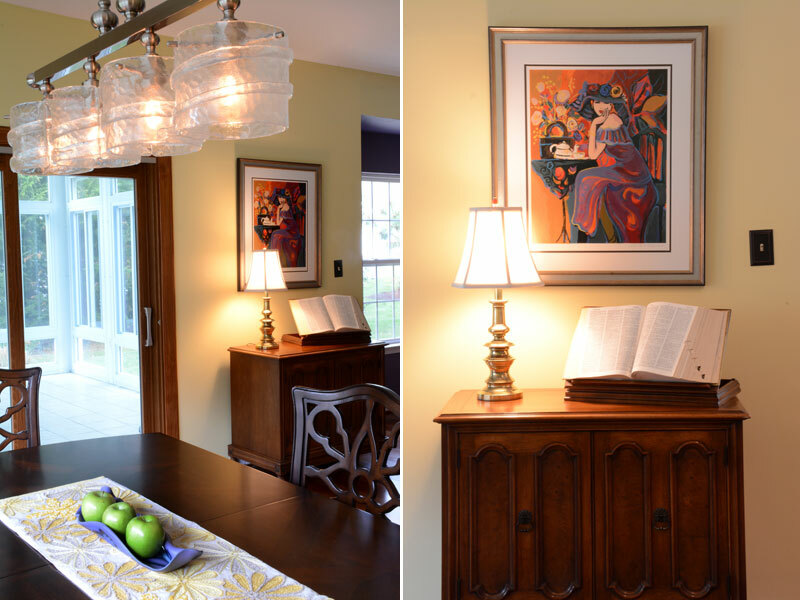 We took the opportunity to celebrate a family heirloom – the dictionary prominently displayed with its own task light. Wall art is added to the composition, and introduces vivid colors to the room. 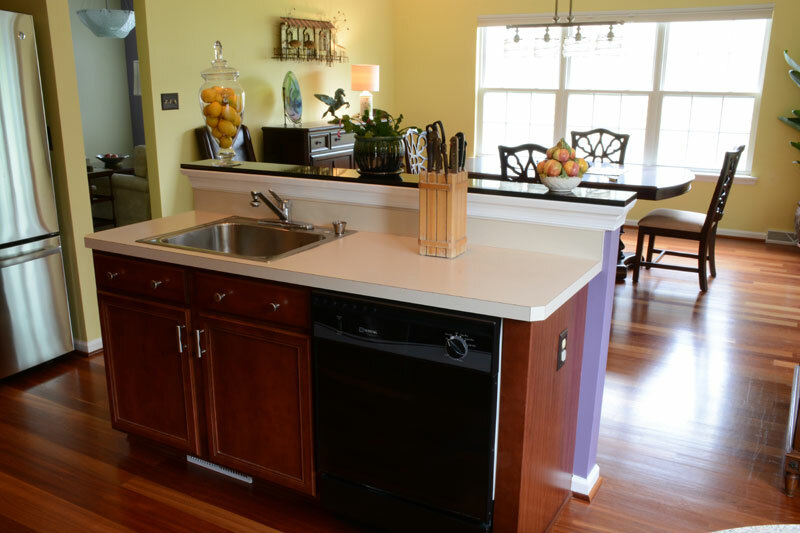 MONI’S RETREAT – Kitchen | Rehoboth Beach, DEWe inherited a completed kitchen. However we undated the appliances, added color, lighting, and a bold stainless steel hardware to doors and drawers. As we age our vision is impaired. Hence. we installed contrasting switch and outlets plates to aid visual acuity. MONI’S RETREAT – Kitchen | Rehoboth Beach, DEWhether breakfast, lunch or just reading the morning papers – the breakfast nook, embraced in its accented purple walls, imbues refreshment and relaxation. The large bay window is a vista to the ever changing seasonal landscape as it invites in the soft northern light.